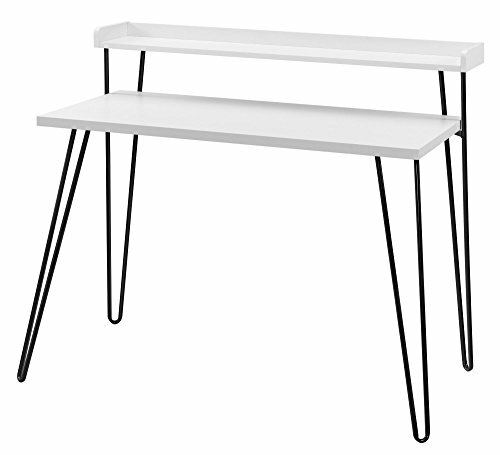 Mix industrial and modern styles together to get the Ameriwood Home haven retro desk with riser. This desk is perfect for tight spaces with its small foot print and offers 2 levels of desk space with the added riser. The white woodgrain finish coordinates with almost any décor while the laminated particleboard desktop and powder-coated metal legs give this desk a sturdy build along with a fun design. Use the haven desk in a home office or create an office space that works for you anywhere in your home. The desk top is large enough to hold your laptop, notebooks, and office essentials while the riser can be used to keep items close by but out of your way. The metal hairpin legs are a fun throwback to popular mid-century design. Haven retro desk with riser ships flat to your door and requires minimal assembly upon delivery. Two adults are recommended for proper assembly. Desk can hold up to 70 lbs. While the riser can hold 20 lbs. Once assembled, desk measures to be 35.4”H x 44.7”W x 23.8”D. The desk is perfect for small spaces and offers a riser for extra storage for office supplies. Haven retro desk with riser ships flat to your door and requires minimal assembly Upon delivery.. desk can hold up to 70 lbs. While the riser can hold 20 lbs.